Holland ULL offers a 12' wood cabinet with CNC and laser cut logos is custom finished. 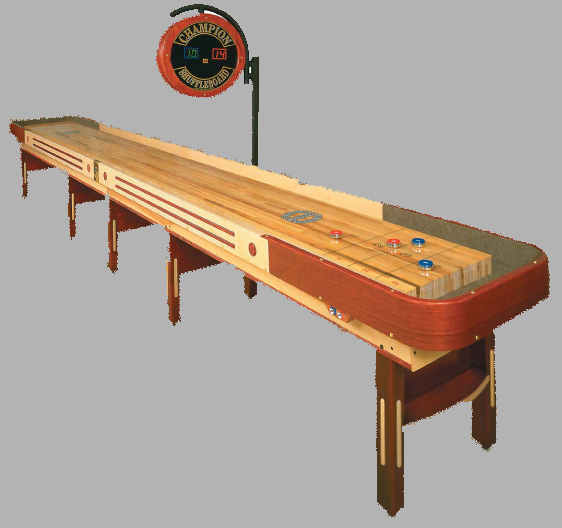 16" wide playfield lays in a carpeted cradle and has climatic adjusters for consistent play. 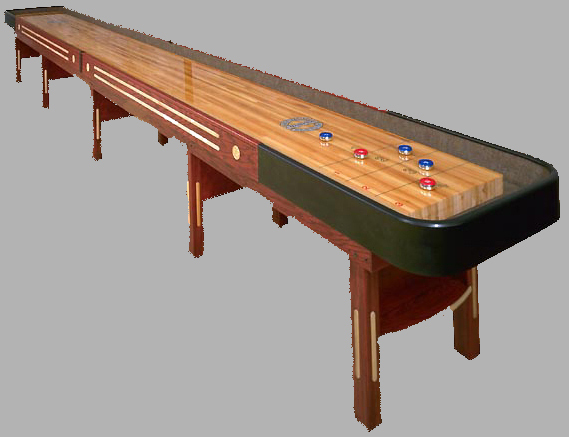 Multiple coats of lacquer provide a durable play surface with your choice of logo prominently displayed on each side. 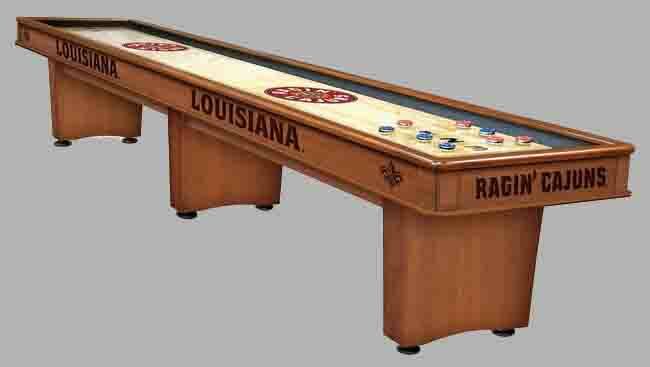 Holland LSU offers a 12' wood cabinet with CNC and laser cut logos is custom finished. 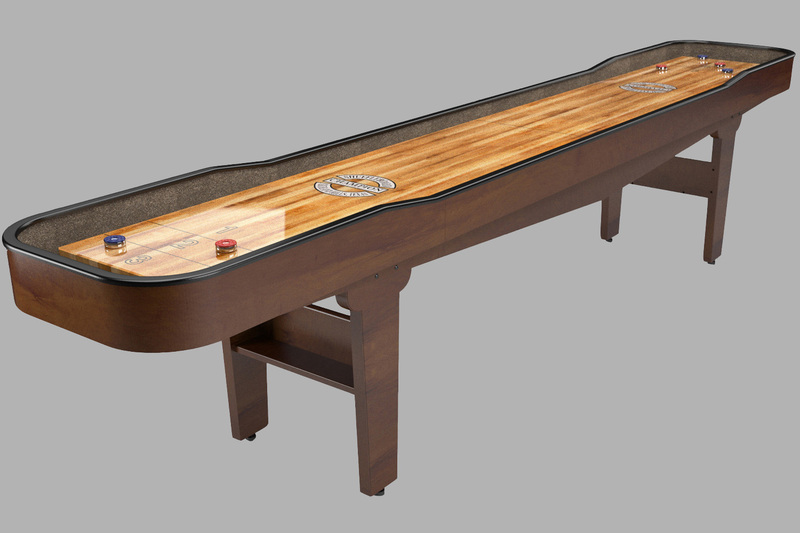 16" wide playfield lays in a carpeted cradle and has climatic adjusters for consistent play. 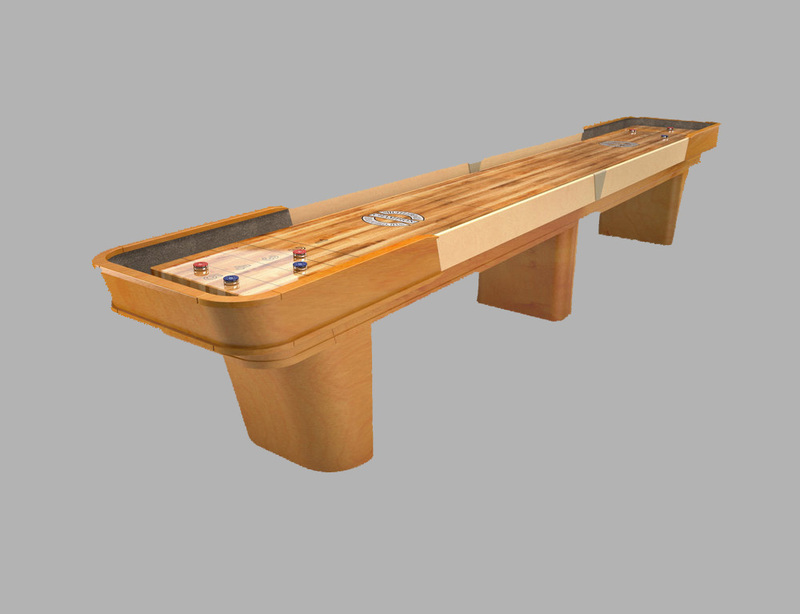 Multiple coats of lacquer provide a durable play surface with your choice of logo prominently displayed on each side. 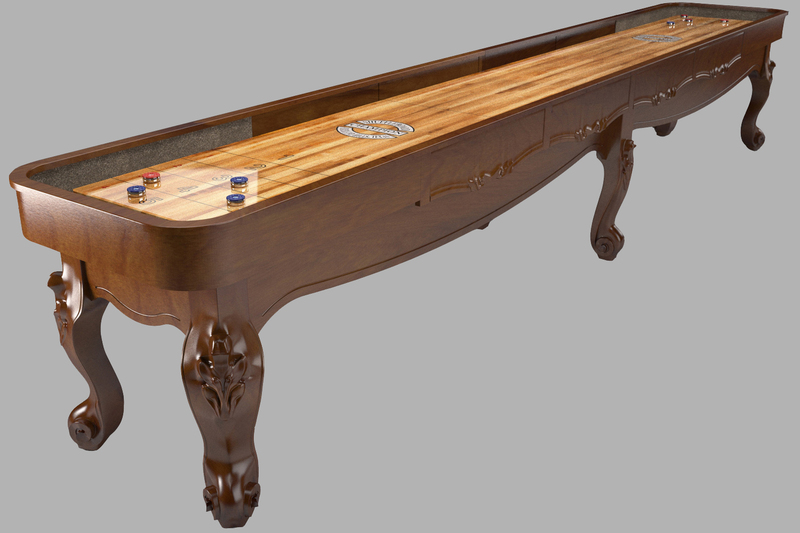 The Brunswick Andover II features a North American Maple Wood playfield and Polymer Resin surface giving it both exquisite playability and appearance. Equipped with storage shelves and all all the accessories you need to start playing right away this is a must have. It is available in either 12' or 14' and comes in your choice of Chestnut, Espresso or Driftwood Finish(shown). 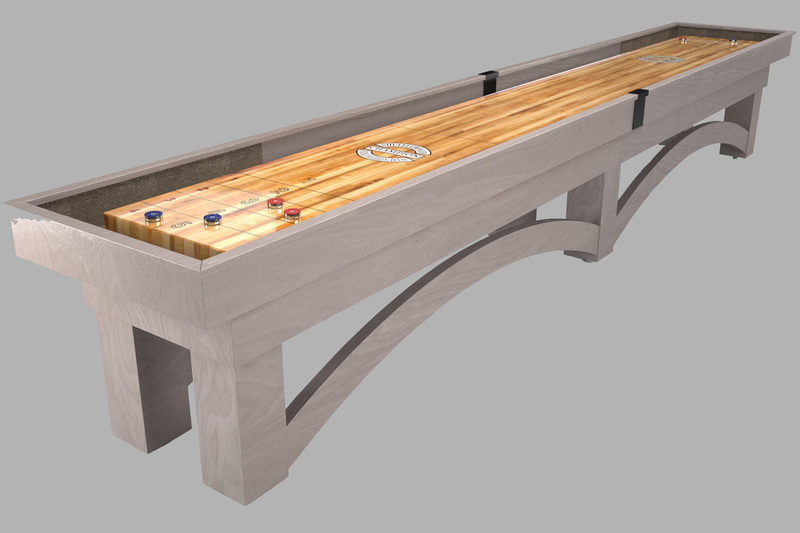 The Brunswick Brixton Shuffleboard features clean lines and a sturdy yet streamlined design that showcases its unique "X" foundation perfectly complimenting the Brixton Pool Table. It is available in a 12', 14' or 16' option with a stunning Driftwood Finish. 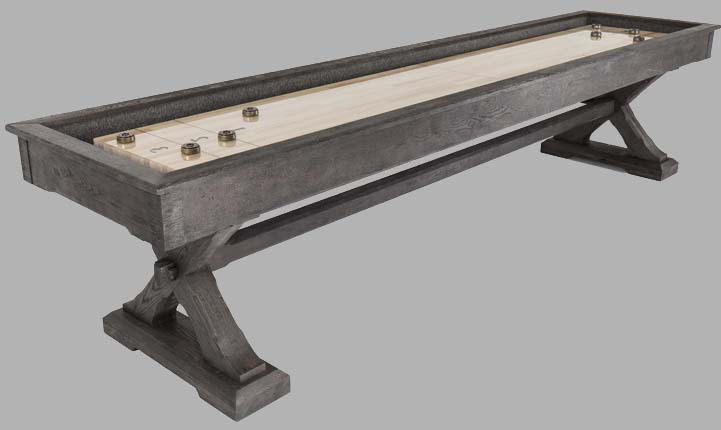 The Brunswick Merrimack Shuffleboard is currently available in a 12', 14' or 16' length and nutmeg finish. 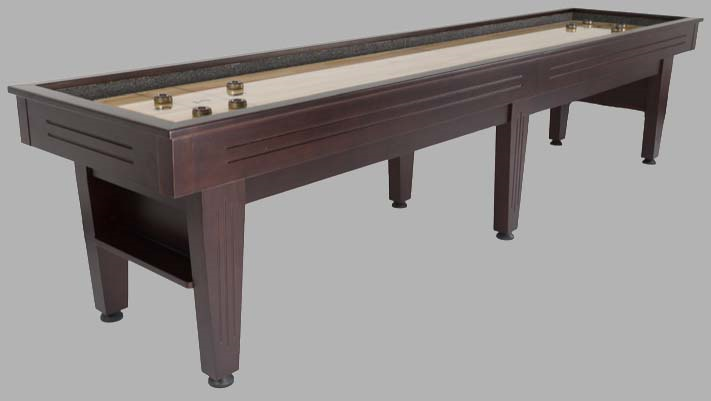 With the same old world charm as the matching pool table, it includes a beautiful hand rubbed antique finish and metal hardware. 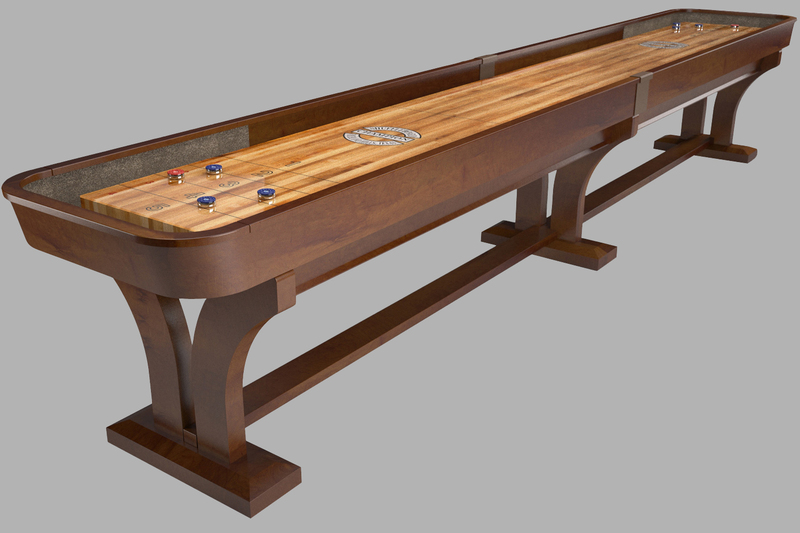 The Brunswick Canton Shuffleboard features aged metal turn-buckle stretcher, corners and hardward. The hand-rubbed antique finish showcases the natural grains and texture of the cabinet's roug-hewn wood. 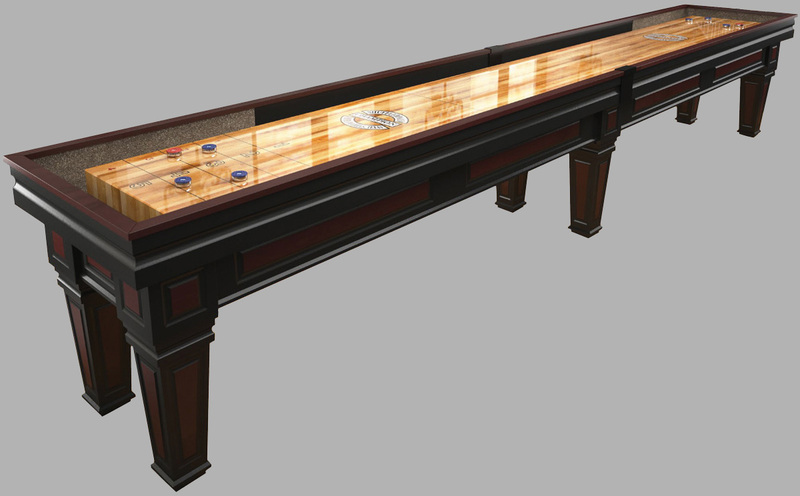 This 12' stunner is available in a black forest finish to perfectly compliment the Canton Pool Table. 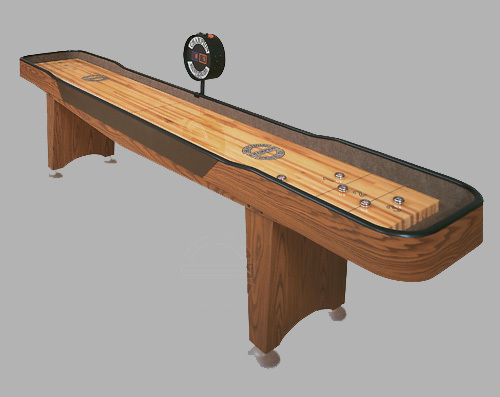 The Presidential Carmel Shuffleboard comes in a 12 foot size. 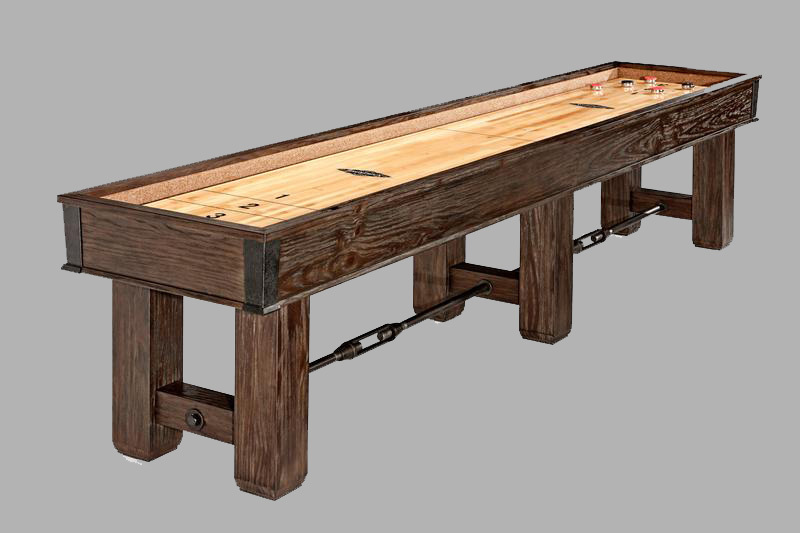 With a Weathered Oak finish, it is a Solid Hardwood Table that is perfect for your game room experience! 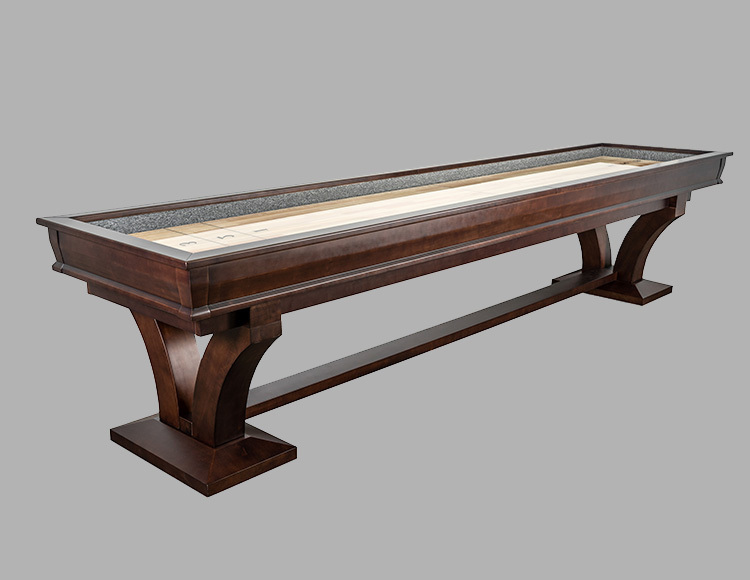 The Presidential Hamilton Shuffleboard is available in a 12' Espresso finish to perfectly compliment the matching pool table or stand out all on its own adding instant elegance to any room. 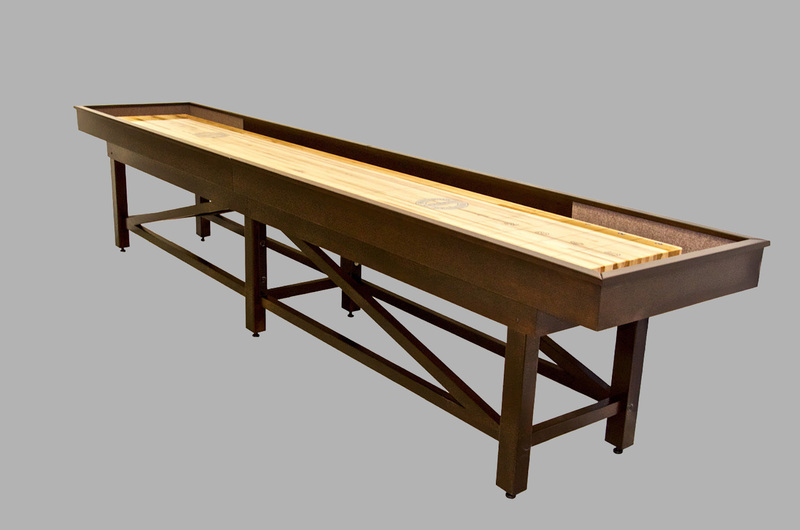 The Presidential Pierce Shuffleboard is available in a 12ft option only with your choice of Natural Oak or Natural Walnut Finish. 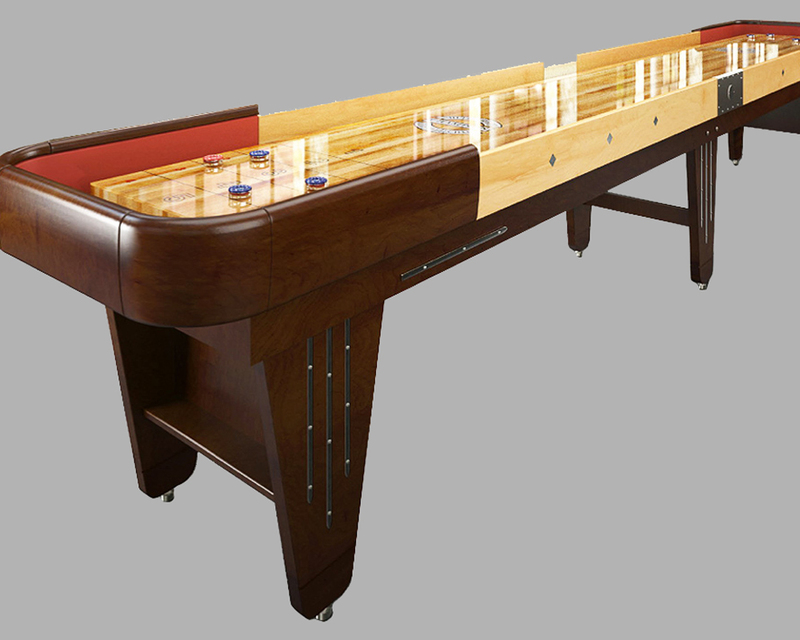 With its X shaped Stainless Steel legs it perfectly compliments the Pierce Pool Table. 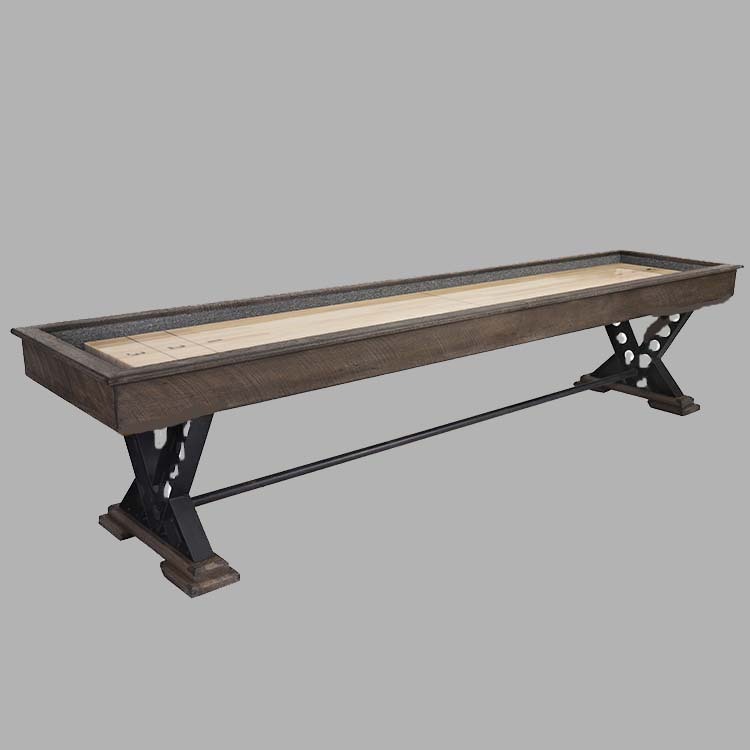 The Presidential Tyler Shuffleboard comes in a Rustic Oak Finish perfectly matching the Tyler Pool and Poker/Dining Tables to complete your room. Available in a 12ft option only. 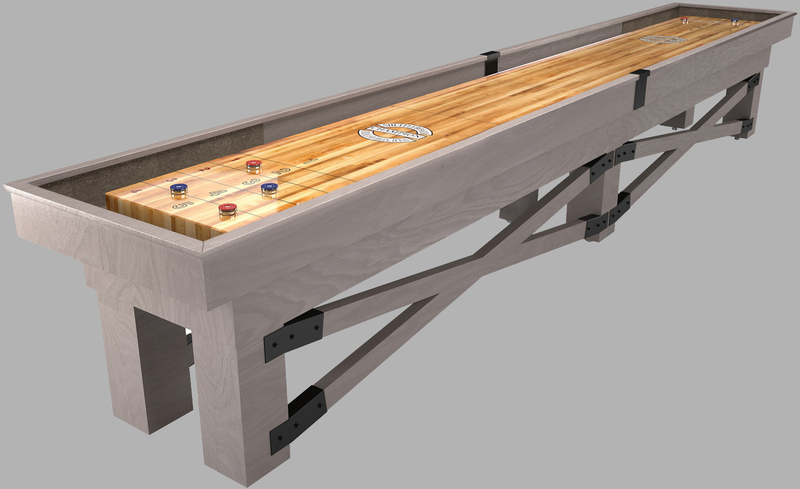 The Champion Steel Sheffield allows you to take your shuffleboard game outside! A steel frame offers an all new look and unquestionable durability. The premium steel cabinet gives it a contemporary design with a sport silver powder coat finish. Optional features include weather wise playfield and can be customized with your logo. Shown in Machine Gray. 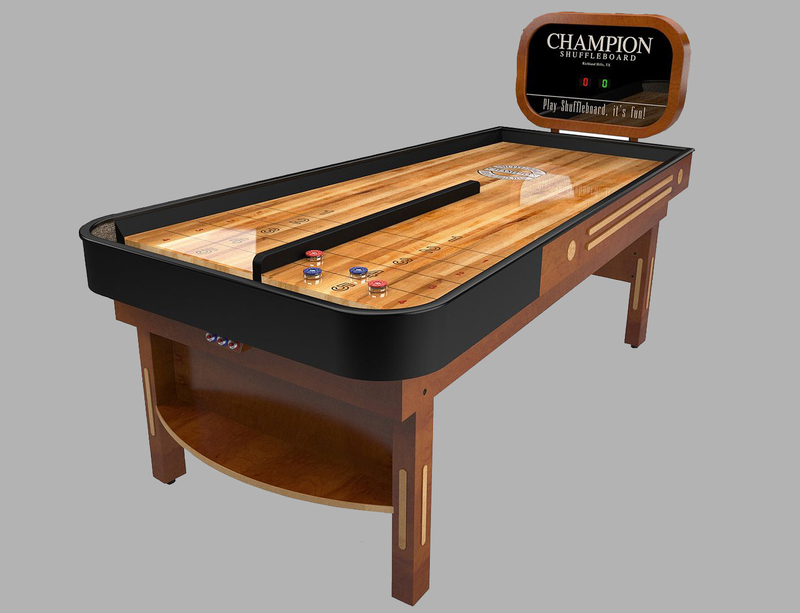 The Champion Bank Shot brings a new way to play to every game room! Oak or Maple veneer are standard on this 7' stunner. Options include custom stains and can be customized with your logo. Shown in Honey with Natural Inlays on Maple.